The list contains European stadiums with a capacity of at least 25,000. Almost all of these stadiums were built mainly for association football. Most of the rest were built for athletics, the rugby codes, or (in Ireland) Gaelic games. An asterisk - * - indicates that a team does not play all of its home matches at that venue. The "Category" column indicates whether the stadium has been designated by UEFA as capable of hosting Champions League or Europa League matches. 1 Camp Nou 99,354 (105,000 planned) Barcelona Spain FC Barcelona. 2 Wembley Stadium 90,000 London England The FA, England national football team. 65,829 (d) Dortmund Germany Borussia Dortmund. 2006 FIFA World Cup venue. 6 Santiago Bernabéu Stadium 81,044 Madrid Spain Real Madrid C.F, Spain national football team. 7 Luzhniki Stadium 81,000 Moscow Russia Russia national football team*. 75,000 (athletics) Saint-Denis France France national football team, France national rugby union team. 9 San Siro 80,000 Milan Italy A.C. Milan and F.C. Internazionale Milano. 1990 FIFA World Cup venue. 2001 UEFA Champions League Final venue. 11 Athens Olympic Stadium 75,000 Athens Greece AEK Athens F.C. 2007 UEFA Champions League Final venue. 70,000 (d) Munich Germany FC Bayern Munich. 13 Old Trafford 74,994 Manchester England Manchester United F.C. 14 Olympiastadion 74,649 Berlin Germany Hertha BSC. 15 Millennium Stadium 74,500 Cardiff Wales Welsh Rugby Union. 1999 Rugby World Cup Final venue. 16 Stadio Olimpico 70,634 Rome Italy S.S. Lazio and A.S. Roma. 17 NSC Olimpiyskiy 70,050 Kiev Ukraine Ukraine national football team*, FC Dynamo Kyiv. UEFA Euro 2012 Final venue. 19 Baku Olympic Stadium 68,700 Baku Azerbaijan Azerbaijan national football team, Qarabağ FK. 2019 UEFA Champions League Final venue. 21 Stade Vélodrome 67,394 Marseille France Olympique de Marseille. 23 Krestovsky Stadium 67,000 Saint Petersburg Russia Zenit Saint Petersburg. 24 Estádio da Luz 64,642 Lisbon Portugal S.L. Benfica. 54,142 (d) Gelsenkirchen Germany FC Schalke 04. 26 Estadio Benito Villamarín 60,720 Seville Spain Real Betis. 54,906 (d) Stuttgart Germany VfB Stuttgart. 29 Stadio San Paolo 60,240 Naples Italy S.S.C. Napoli. 54,000 (nd) London England 2012 Summer Olympics and Paralympics as 80,000 seat athletics venue. 32 Parc Olympique Lyonnais 59,186 Lyon France Olympique Lyonnais. 33 PGE Narodowy 58,580 Warsaw Poland Poland national football team. 34 Stadio San Nicola 58,248 Bari Italy FC Bari 1908. 36 Volksparkstadion 57,274 Hamburg Germany Hamburger SV. 38 Arena Naţională 55,634 Bucharest Romania Romania national football team. 39 Stadium Rajko Mitić 55,538 Belgrade Serbia Red Star Belgrade. 42 Estadi de Mestalla 55,000 Valencia Spain Valencia CF. 43 Esprit Arena 54,600 Düsseldorf Germany Fortuna Düsseldorf. 44 Vicente Calderón Stadium 54,851 Madrid Spain Atlético Madrid. 49 Borussia-Park 54,067 Mönchengladbach Germany Borussia Mönchengladbach. 50 Johan Cruyff Arena 54,990 Amsterdam Netherlands AFC Ajax. 52 San Mamés 53,332 Bilbao Spain Athletic Bilbao. 53 Ernst Happel Stadion 53,008 Vienna Austria Austria national football team, Rapid Vienna*, Austria Vienna*. 56 Donbass Arena 52,187 Donetsk Ukraine FC Shakhtar Donetsk, UEFA Euro 2012 venue. 59 De Kuip 51,577 Rotterdam Netherlands Feyenoord. 60 Commerzbank-Arena 51,500 Frankfurt Germany Eintracht Frankfurt. 65 Estádio José Alvalade 50,095 Lisbon Portugal Sporting Clube de Portugal. 67 Estádio do Dragão 50,033 Porto Portugal F.C. Porto. 71 HDI-Arena 49,000 Hanover Germany Hannover 96. 2006 FIFA World Cup venue. 75 Stadio Artemio Franchi 47,282 Florence Italy ACF Fiorentina. 76 Volgograd Arena 45,568 Volgograd Russia Rotor Volgograd. 77 Otkrytie Arena 45,360 Moscow Russia Spartak Moscow. 78 Kazan Arena 45,105 Kazan Russia Rubin Kazan. 37,868 Rostov-on-Don Russia FC Rostov. 82 Cosmos Arena 44,918 Samara Russia Krylia Sovetov Samara. 83 Strelka Stadium 44,899 Nizhny Novgorod Russia FC Nizhny Novgorod. 28,000 Saransk Russia Mordovia Saransk. 85 Red Bull Arena 44,345 Leipzig Germany RB Leipzig. 95 Estadio Ramón Sánchez Pizjuán 42,714 Seville Spain Sevilla FC. 96 Weserstadion 42,500 Bremen Germany SV Werder Bremen. 40,000 Sochi Russia PFC Sochi. 114 Stadio Renato Dall'Ara 39,444 Bologna Italy Bologna F.C. 1909. 115 Stadio Marcantonio Bentegodi 39,211 Verona Italy A.C. ChievoVerona, Hellas Verona F.C..
116 Estadio Manuel Martínez Valero 38,750 Elche Spain Elche CF. 121 Stadio Renzo Barbera 37,619 Palermo Italy Italy U.S. Città di Palermo. 127 Stadio Luigi Ferraris 36,536 Genoa Italy Genoa C.F.C., U.C. Sampdoria. 147 Riazor 34,600 A Coruña Spain Deportivo La Coruña. 148 La Romareda 34,596 Zaragoza Spain Real Zaragoza. 175 Estadio Balaídos 32,500 Vigo Spain Celta de Vigo. 193 Teddy Stadium 31,800 Jerusalem Israel Beitar Jerusalem F.C., Hapoel Katamon Jerusalem F.C., Hapoel Jerusalem F.C. 200 Tofiq Bahramov Stadium 31,200 Baku Azerbaijan Qarabağ FK, Azerbaijan national football team. 204 Sammy Ofer Stadium 30,870 Haifa Israel Maccabi Haifa F.C., Hapoel Haifa F.C. 215 BayArena 30,210 Leverkusen Germany Bayer 04 Leverkusen. 217 Rhein-Neckar Arena 30,150 Sinsheim Germany TSG 1899 Hoffenheim. 219 Volkswagen Arena 30,122 Wolfsburg Germany VfL Wolfsburg. 222 Estadio La Rosaleda 30,044 Málaga Spain Málaga CF. 228 Estadio José Rico Pérez 30,000 Alicante Spain Hércules CF. 238 El Molinón 29,029 Gijón Spain Sporting de Gijón. 276 Estadio José Zorrilla 26,512 Valladolid Spain Real Valladolid. 295 Stadio Friuli 25,144 Udine Italy Udinese Calcio. The following is a list of European stadiums which are currently under construction and will have a capacity of 25,000 or more. ↑ "Camp Nou - FC Barcelona". Retrieved 25 December 2014. ↑ 2.00 2.01 2.02 2.03 2.04 2.05 2.06 2.07 2.08 2.09 2.10 2.11 2.12 2.13 2.14 2.15 2.16 2.17 2.18 2.19 2.20 2.21 2.22 2.23 2.24 2.25 "List of UEFA Category 4 Stadiums". World Stadium Database. Retrieved 21 June 2015. ↑ 3.00 3.01 3.02 3.03 3.04 3.05 3.06 3.07 3.08 3.09 3.10 3.11 3.12 3.13 3.14 3.15 3.16 3.17 3.18 3.19 3.20 3.21 3.22 3.23 3.24 3.25 3.26 3.27 3.28 3.29 3.30 "List of UEFA Elite Stadiums 2011". Impressive Buildings. Retrieved 21 June 2015. ↑ Wembley Stadium - Presspack The stadium has 90,000 seats with no obstructed views. Retrieved 2 January 2010. ↑  Wembley to stage UEFA EURO 2020 final. Retrieved August, 12, 2017. ↑ Pearse Stadium http://www.galwaygaa.ie/galway-gaa-grounds/galway-gaa-grounds-2---figures. Retrieved 21 July 2018. Missing or empty |title= (help)[dead link] Croke Park has a capacity of 91,197. Retrieved 31 January 2018. ↑ RFU: Twickenham Stadium Welcome to Twickenham Stadium, the home of English rugby. Seating an impressive 82,000 spectators, Twickenham is the largest dedicated rugby union venue in the world.. Retrieved 2 January 2010. ↑ "Santiago Bernabéu Stadium". realmadrid.com. Retrieved 3 March 2014. ↑ "World Cup 2018 stadiums (Russia)". Retrieved 25 December 2014. ↑ Stadium capacity is 80,698 for (mostly rugby) football matches with movable lower tier of seating deployed over the athletics track, and ~75,000 for athletics events with the lower seating tier retracted back under the second tier to reveal the running track. : (Stade de France database entry at StadiumDB.com). Retrieved 20 June 2015. ↑ Stadio San Siro. "Struttura". Stadio San Siro. Retrieved 2018-05-15. ↑ "Turkish Football Federation". TFF. Retrieved 20 March 2013. ↑ "Athens Olympic Stadium - Description". oaka.com.gr. Archived from the original on 29 September 2011. Retrieved 2 June 2014. ↑ "Manchester United". PremierLeague.com. Premier League. Archived from the original on 3 December 2011. Retrieved 17 December 2011. ↑ "Facts and Figures: Olympiastadion Berlin". Archived from the original on 27 April 2015. Retrieved 25 December 2014. ↑ "Stadio Olimpico –". Stadiumdb.com. Retrieved 20 March 2013. ↑ "Olympiapark München". Olympiapark.de. Retrieved 2018-05-15. ↑ Whetstone, Sean (15 February 2014). "The Black and White Seated Olympic Stadium". West Ham Till I Die. Retrieved 4 September 2015. ↑ 25.0 25.1 Keogh, Frank (19 June 2015). "West Ham: David Gold says Hammers 'will fill Olympic Stadium'". BBC Sport. Retrieved 20 June 2015. Gold wants the Hammers to "worry" the big five Premier League clubs after moving from the Boleyn Ground to their new 54,000-capacity home next year. ↑ William, Helen (29 May 2013). "Green light for Olympic Stadium makeover". The Independent. London. ↑ "Premier League Handbook 2017–18" (PDF). Premier League. 11 August 2017. Retrieved 4 November 2017. ↑ "The stadium expansion". MCFC OWS. Manchester City F.C. Retrieved 20 June 2015. As of June 2014, Phase 2 is underway. A further three rows of seats will be built pitch side, taking the Etihad Stadium's total capacity to more than 55,000. Both Phases 1 and 2 are due to be completed in time for the start of the 2015/2016 Barclays Premier League season. ↑ "Tbilisi Official Website". FC Dinamo Tbilisi. Retrieved 20 November 2014. ↑ "Home". Retrieved 25 December 2014. ↑ "Anfield: The Home of LFC". This Is Anfield. Retrieved 9 March 2016. ↑ "Stat Arama Detay TFF". Tff.org. Retrieved 2018-05-15. ↑ "Daten – Commerzbank-Arena Frankfurt am Main". Retrieved 25 December 2014. ↑ "Rangers Football Club". Retrieved 25 December 2014. ↑ "Estádio do Dragão – História" (in Portuguese). FC Porto. ↑ "Fritz-Walter-Stadion". Retrieved 25 December 2014. ↑ 39.0 39.1 "FB ŞÜKRÜ SARACOĞLU - Stat Arama Detay TFF". Tff.org. Retrieved 20 March 2013. ↑ "KLUB - Stadion". Lechpoznan.pl. Archived from the original on 29 October 2012. Retrieved 20 March 2013. ↑ WROCŁAW 2012 - NOWY STADION WE WROCŁAWIU Archived 30 April 2010 at the Wayback Machine Net number of seats under roof, Polish league: 42,771. Retrieved 2 January 2010. ↑ "Club Records". LeedsUnited.com. Archived from the original on 8 August 2010. Retrieved 1 March 2009. ↑ "1. FSV Mainz 05". Archived from the original on 21 August 2016. Retrieved 24 August 2016. ↑ "Pearse Stadium (Salthill)". Galwaygaa.ie. Retrieved 2018-05-15. ↑ "Informacje". Wisla.krakow.pl. Retrieved 20 March 2013. ↑ "Le stade". MSHCfoot.com (in French). Montpellier HSC. Retrieved 23 August 2009. ↑ "Wolves plan £40m ground expansion". BBC News. 28 May 2010. ↑ "İlham Əliyev Respublika Stadionunun açılışını edib - Fotolar". Azadliq.org. 16 August 2012. Retrieved 20 March 2013. ↑ "Estádio Municipal de Braga". SC Braga. Retrieved 2 September 2017. ↑ "Património". vitoriasc.pt. Vitória Sport Clube. Retrieved 31 August 2017. ↑ Муніципальний спорткомплекс "Металург" (in Ukrainian). Archived from the original on 26 January 2010. Retrieved 28 August 2010. "World Cup 2018 stadium". March 2013. ↑ "Estádio Cidade de Coimbra". Associação Académica de Coimbra. Retrieved 2 September 2017. ↑ "ŞANLIURFA GAP ARENA - Stat Arama Detay TFF". Tff.org. Retrieved 20 March 2013. ↑ "FC LOKOMOTIV MOSCOW". Archived from the original on 15 August 2010. Retrieved 28 August 2010. ↑ "FCSB - site-ul oficial al FC Steaua Bucuresti". Steauafc.com. 14 August 1991. Retrieved 20 March 2013. ↑ "FC "Karpaty" Lviv. | Club - Stadium". Fckarpaty.lviv.ua. Retrieved 20 March 2013. ↑ "Stadiums in Northern Cyprus". World Stadiums. Retrieved 20 March 2013. ↑ "Stadiums in England :: Yorkshire & The Humber". World Stadiums. Retrieved 20 March 2013. ↑ "Premier League handbook Season 2013/14" (PDF). Archived from the original (PDF) on 22 January 2014. Retrieved 17 August 2013. ↑ "Stadiums in Georgia". World Stadiums. Retrieved 20 March 2013. ↑ "Stadiums in Russia". World Stadiums. Retrieved 20 March 2013. ↑ "Olympic Football Stadia". BBC News. 15 July 2004. ↑ "Kaftanzoglio Stadium - Thessaloniki, Greece". Kaftanzoglio.gr. Retrieved 20 March 2013. ↑ "www.fcmetz.com". www.fcmetz.com. Archived from the original on 27 September 2013. Retrieved 20 March 2013. ↑ "Real Valladolid C.F. S.A.D - Estadio del Club". Realvalladolid.es. Retrieved 20 March 2013. ↑ "Grounds for debate". West Bromwich Albion F.C. 10 September 2008. Archived from the original on 17 December 2008. Retrieved 22 August 2009. ↑ Gunther Lades. "Football stadiums of the world - Stadiums in Azerbaijan". Fussballtempel.net. Retrieved 20 March 2013. ↑ "Welcome to sc Heerenveen - sc Heerenveen". Sc-heerenveen.nl. Archived from the original on 27 February 2010. Retrieved 20 March 2013. ↑ "RSC Olympiyskiy". Archived from the original on 18 August 2010. Retrieved 28 August 2010. ↑ "Conference facility in Ireland | Stadium Access Plan". Thomondpark.ie. Retrieved 15 August 2013. ↑ 78.0 78.1 "Stadiums in Ireland". World Stadiums. 2015-11-17. Retrieved 2018-05-15. ↑ "Dr. Hyde Park to host Connacht finals". Archived from the original on 2015-06-26. Retrieved 2018-05-15. ↑ O'Riordan, Ian (2016-03-29). 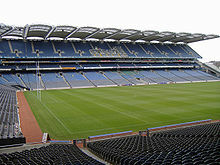 "Roscommon determined to host Dubs at Hyde Park". The Irish Times. Retrieved 2018-05-15. ↑ "motor-altenburg.de". Retrieved 11 February 2017. ↑ "darlington-fc.net". Archived from the original on 20 January 2016. Retrieved 25 December 2014. ↑ "CITY ARENA TRNAVA I Stadium + Hotel + Mall". Cityarenatrnava.com. Retrieved 2018-05-15. ↑ "FSHF Fati qoftë me ne por fitoren na e jep puna! [quote: ...stadiumit, i cili është një stadium me katër yje,...]". Archived from the original on 23 April 2015. Retrieved 9 April 2015. ↑ "Peter Lim named new Valencia CF owner". Archived from the original on 25 May 2014. Retrieved 24 May 2014. This page was last changed on 1 April 2019, at 12:25.